There is nothing like Christmas through a child's eyes. William Lauren Rhoades grew up in the 1870's and 80's at the Sierra Madre Villa Hotel. His dad, William Porter Rhoades, was the proprietor of the Villa and co-owned the Villa along with his father in law, artist William Cogswell. As an old man, William Lauren recounted the history of the Sierra Madre Villa and wrote about the Christmas of his childhood. The story includes a donkey named after his mom, a giant Christmas tree, and a gift exchange between the two cultures that lived full time at the Villa -- that of the Rhoades and Cogswell families, who had migrated west from New York, and that of a group of Chinese men, who had originally migrated east to work on the railroads and then staffed the Villa. . The Sierra Madre Villa Hotel was a famous West Coast resort located in the foothills of what is now East Pasadena. 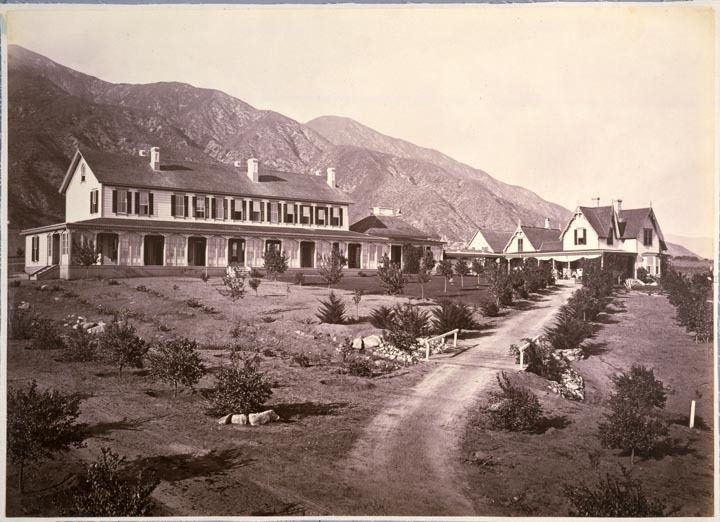 The Hotel is the namesake of Pasadena's Villa Street and Sierra Madre Villa Avenue, which served as the access to the old hotel. If you're interested to know more, I've a dozen or so posts on the Villa that are categorized under the Labels heading on the right side of this blog. Organized Christmas displays in the Upper Hastings Ranch neighborhood have been a tradition since 1957. Last year I spoke with the "mayor" of Hastings Ranch and my 2010 Christmas post has some interesting history of this great annual event. We drive Hastings Ranch several times during the Christmas season and I always enjoy it. One of my favorite houses has relatively little in the light category, but shows the old Rudolph the Red Nose Reindeer TV special from the 60's. There is a large screen set up on the front lawn the show plays continually with sound. Seems whenever I drive by there are cars parked in front of the house and sometimes kids sitting on the grass watching the show. The house in on Daveric just south of Alegria. Of course, when in Hastings Ranch you can also see the lights of the valley below. Upper Hastings Ranch is on a mesa in the foothills of the San Gabriel Mountains and affords some wonderful views. Eucalyptus trees blew down on Sierra Madre Villa. Six trees all probably more than 100 yeas old. As you can tell from the trunks, these were very big trees. The trees just fell over and were strewn along the road nearly end to end.. It was sad, strange and fascinating all at the same time to walk the length of these giant trees, from roots to the tree tops. And, standing in the middle of these trees there was this powerful scent of Eucalyptus. Tree fell knocking down power lines and a power pole on Sierra Madre Blvd. There was a Channel 2 news van parked on the median while I drove past. Oak tree uprooted and fallen on van.